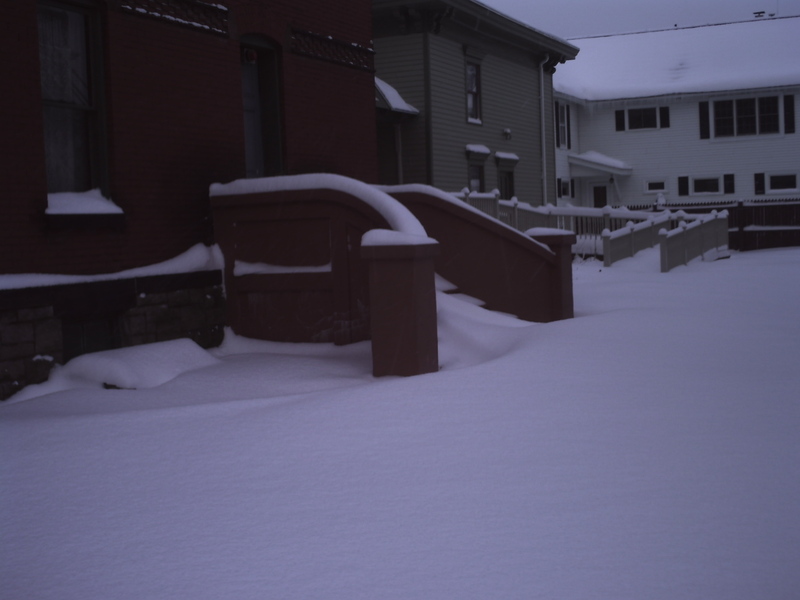 Just to give you an idea as to how much snow Herkimer got. Have I mentioned that I really hate snow? Well, I’m gonna mention it again for old time’s sake. The weather the last couple of days have been horrible. In fact, I had to cancel yet again on another trip to go see my brother. It’s not so much the snow, but the wind gusts are horrible, especially in the Mohawk Valley, where I live. I hate the fact that the wind causes the snow to drift all over the place making the roads horrible and hard to travel on. I was pretty much all set to go down and see my brother yesterday. I had to stay overnight somewhere else because the trip from Central New York to where my brother lives is about two hours, even longer during bad winter weather. So I ended up coming home yesterday afternoon. It just wasn’t worth it with this horrible weather. And the thing is that it’s supposed to snow all week. I’m gonna try to go down again next weekend. Hopefully by then things will have calmed down a bit. I would have gone online sooner yesterday afternoon, but I wasn’t feeling too well. I had a bit of an upset stomach and so I had to lay down for the remainder of the day. I got up a little later and had dinner with my brother-in-law and my sister’s family. I was also able to catch up on my emails and Twittering that I missed during the day I was out of town. Anyway, it looks like I’m gonna be shovelling tomorrow morning at the Historical Society. There’s probably gonna be about a foot of snow on the ground over there. Sigh. A winter warrior’s work is never done. I swear, if anyone has a reason to harbor a personal grudge against Old Man Winter, it’s me. This entry was posted in Diary and tagged central new york, Mohawk Valley, Old Man Winter, snow, snowstorm, weather, winter. Bookmark the permalink. I followed your blog for three days and I must say that I begin to love your message. How do I subscribe to your blog now? Thank you for that smart critique. Me & my neighbour were preparing to do some research about that. We obtained a beneficial book on that matter from our local library and most books exactly where not as influensive as your information and facts. I’m pretty glad to see such information and facts which I was searching for a lengthy time. Magnificent site. Lots of useful info here. I am sending it to some friends ans also sharing in delicious. And naturally, thanks for your effort! Wow, that’s what I was looking for, what a data! existing here at this webpage, thanks admin of this web page. site contains truly nice funny material too. how so much time I had spent for this information! you made blogging look easy. The overall look of your web site is wonderful, as smartly as the content! Very good blog! Do you have any tips for aspiring writers? I’m hoping to start my own website soon but I’m a little lost on everything. Would you recommend starting with a free platform like WordPress or go for a paid option? There are so many choices out there that I’m totally overwhelmed .. Any suggestions? Appreciate it!